Sitting nearly 14 inches off the ground with side rails that act as a brace, you can easily sit on the recumbent trike and use the rails to help you stand when itâ€™s time to dismount. Others claim to have the most comfortable recumbent but Sidewinder recumbent riders know better. Because of the width of our seats and the mesh fabric, even our competitors agree (off the record) that Sidewinder recumbents are the most comfortable recumbent in the world. If you can sit, you can ride. Sidewinder Cycle trikes could be called the Cadillac of recumbents. A trip down the bike path, to the store or just having fun around town, this recumbent is guaranteed to be your number one choice. If storage is your question, all Sidewinder trikes arefolding recumbents. In fact, once completely folded, a Sidewinder recumbent can fit in the trunk of most cars. * Seat Angle: Upright to Reclined Quick Adj. 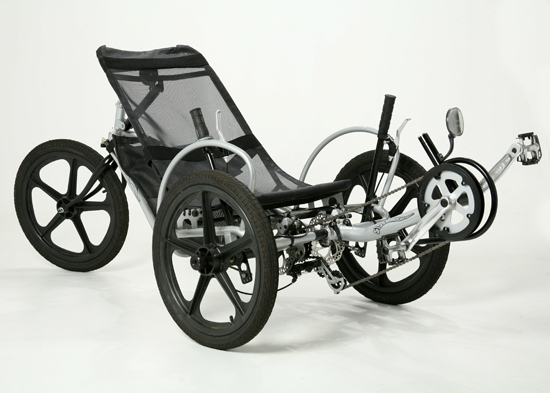 The first recumbent model ever manufactured by Sidewinder Cycle is the ProCruiser. A model of extreme comfort, performance and reliability. Having the proud distinction as being the first recumbent bike model ever built by Sidewinder Cycle, the ProCruiser is the leader in performance. Using Shimano components and Hydraulic disc brakes, the ProCruiser has all the options that will exceed your expectations. Superior seating comfort, smooth ride and folding recumbent frame allows this trike to take you whereever you want. Weight here is not an issue, the ProCruiser can handle up to 400lbs and has a wide seat. Rest your arms on the hand rails as you cruise down the bike path then use them to exit the trike. The Sidewinder ProCruiser has been called the Cadillac of recumbents. No other recumbent can compete with Style, Performance and Comfort of a ProCruiser. The most popular trike in the fleet of recumbents by Sidewinder Cycle is the SportZ. 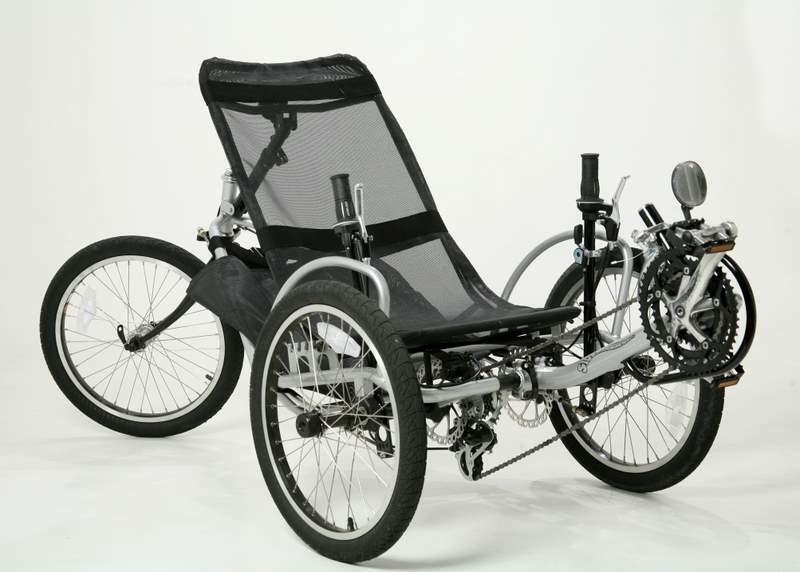 With the highest sitting position in the recumbent industry at 14 inches, the SportZ allows for easy of entry and exit. A quick adjust for seating incline in addition to adjustable lumbar support make this mesh seat almost as comfortable as your favorite chair. The durable steel frame will last a lifetime and can hold up to 400lbs. The SportZ features a mechanical disc brake that provides ultimate safety in braking. Hills become no problem with a 21 gear drive and the downhill is all you. The SportZ is available in three eye catching colors: Candy Apple Red, Viper Yellow and Mercedes Silver. Transporting and storing your recumbent is simple with quick release wheels, folding recumbent frame and easy to remove seat â€“ No tools needed, just 5 minutes! 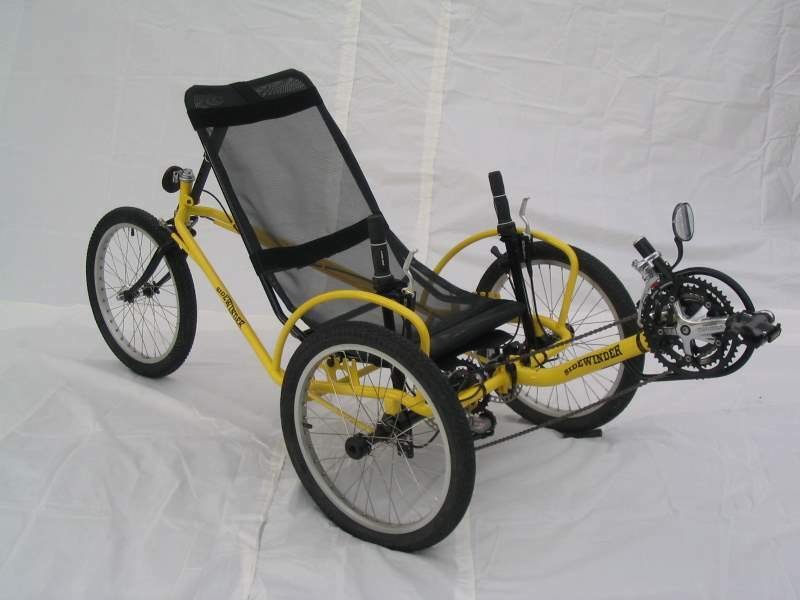 The SportZ recumbent trike has a record of being safe, reliable and easy to operate. And of course, ultimate in comfort. The SportZ can be used for your daily commute, exercise activity or just to have pure fun anywhere, even in the snow.